Hey, world! It’s spring and we’re ready for you with clean, fresh and mochi-soft skin! But your skin won’t get silky, bouncy and smooth by itself. Now’s your chance to start five great new skincare habits for spring. They’ll make all the difference between a blah complexion and a glowing, polished look. Remove Makeup. Every. Single. Night. We get it—some nights, you think you just can’t be bothered to remove your makeup. But removing the day’s grime, foundation and sunscreen is one of the absolutely most important things you can do for your skin. Not only will removing makeup get rid of those nasty impurities that lead to dull skin and breakouts, but a fresh, clean face is primed to absorb all those lovely botanical and high-tech ingredients in your lotions and creams. 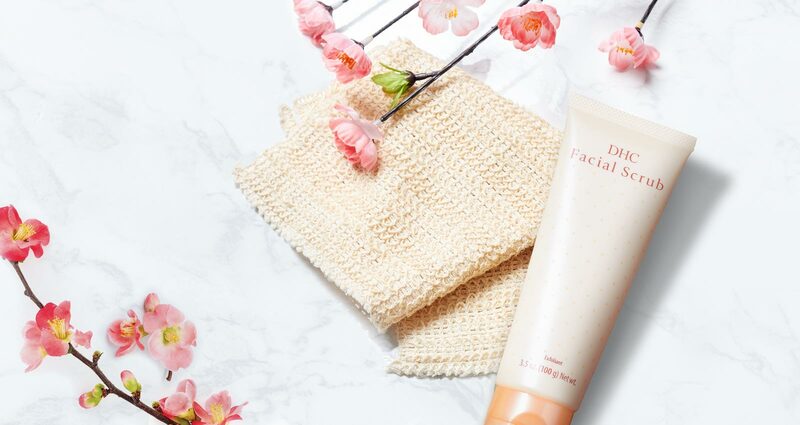 The Japanese double cleanse ritual leaves your skin soft and super clean. Spring is the perfect time to start adding a lotion to your skincare regimen twice a day. In the world of Japanese beauty, lotions (sometimes called toners) are considered a crucial step to prepare skin for more intensive moisture care. Lotions are a world away from the drying toner concoctions you might have seen on drugstore shelves—our lotions refresh and calm with cucumber juice extract, rejuvenate with alpha hydroxy acid, soothe with licorice root extract and protect moisture with humectant-rich glycerin. Simply pour some lotion into your palms and pat it over your face. While your skin is still damp, apply moisturizer. Rich, emollient creams were your friends all winter long. But now that the days are longer and warmer, it’s the perfect time to switch to a lightweight—but hardworking—regimen. Add an ultra-lightweight serum like Super Collagen Supreme to your lineup. Or switch to a weightless, wrinkle-fighting Japanese complexion milk like CoQ10 Milk. One of our most popular lightweight daytime moisturizers, Rich Moisture, thoroughly hydrates dry skin with organic olive oil and squalane while maintaining moisture with sodium hyaluronate. Cleaning your makeup brushes should be a weekly thing, but any time is the right time to start this important habit. Dirty brushes recycle bacteria and grime into your pores, and if left dirty and unconditioned, the hairs on the brushes can become rough enough to damage the skin. Did you know our bestselling Deep Cleansing Oil is an excellent brush cleaner and conditioner? Just pour some on a silicone brush–cleaning pad or the palm of your hand and swirl your dry brushes in the oil until you see the makeup dissolve. Rinse gently in warm water and rest on the side of your sink to dry. Slough off winter’s dull, dry skin and show the world your springtime face with a twice-weekly exfoliating habit. Face Wash Powder merges gentle physical exfoliants with protease enzymes in a lightweight powder-to-foam formula that leaves skin feeling deep-cleaned and pampered. Or go for a more intensive exfoliating experience with Facial Scrub, developed with microbead-free apricot seed granules to polish skin while conditioning with allantoin. Meanwhile in Japan… It’s Golden Week!